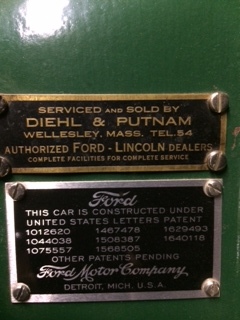 I have posted these in the past and I am hoping that some of you here can add a photo of your dealer dash plaques to the mix. If you are having difficulties posting pictures email me the photo and I will resize and post it here, Thanks! 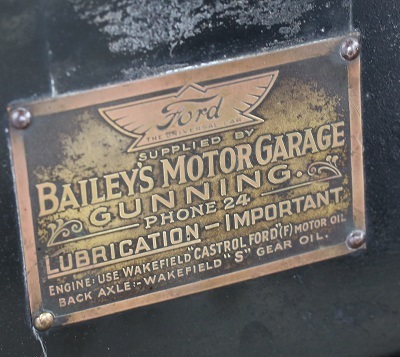 No dash plaque but my '25 came with a dealer scrip on the radiator. 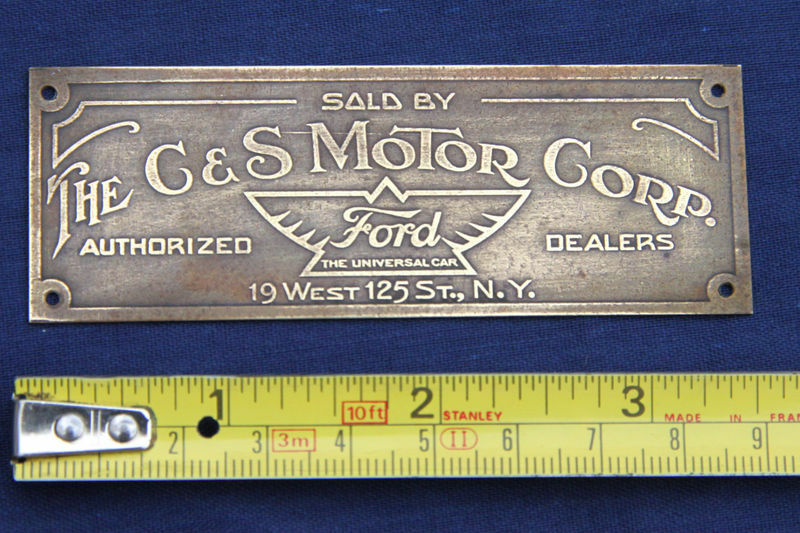 By the way; That San Antonio Body Co. tag is from a truck body only. 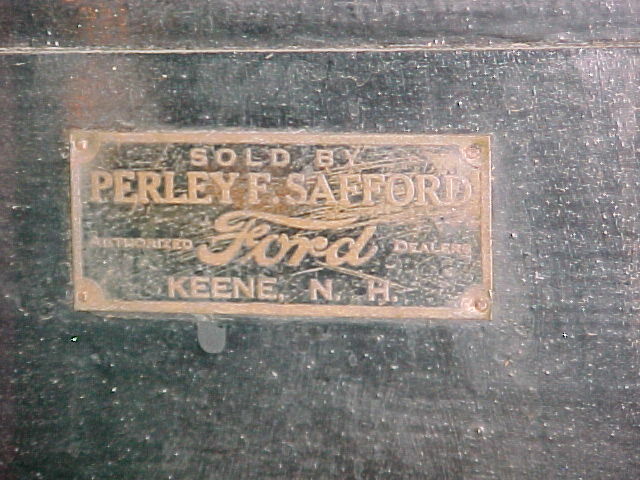 They didn't sell Fords. 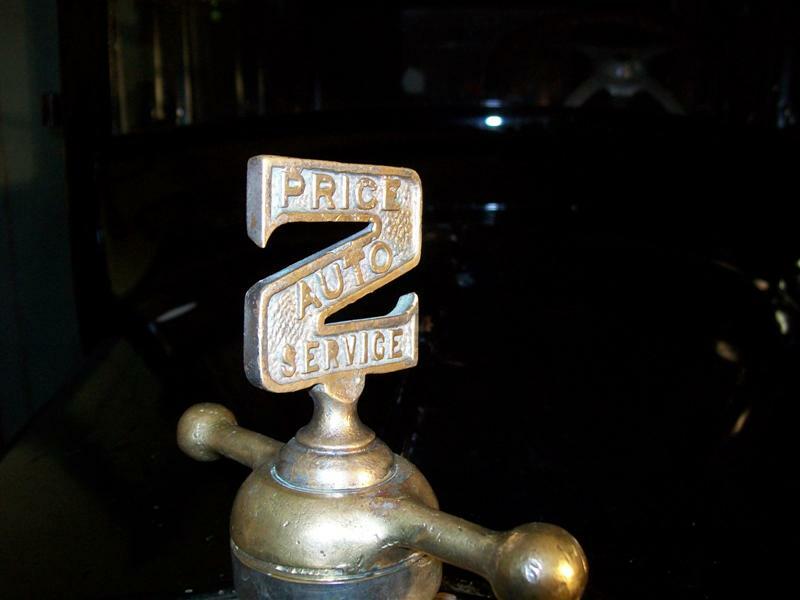 The first Ford dealer in San Antonio was Jordan-Ivers later changed to Jordan Motors. 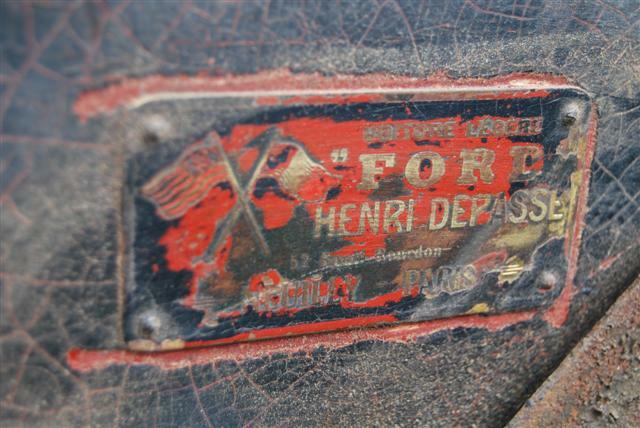 It's still in business today as Jordan Ford. Ops, My error. I had my dealers out of sequence. 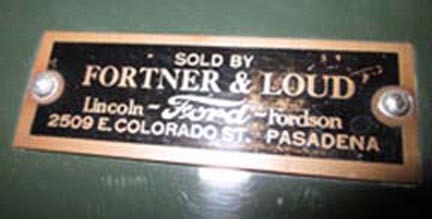 Clifton George was the first Ford dealer in SA. It opened in 1908 next to the Alamo. The photo below was taken about 1918. Mike, Do you or perhaps anyone else know the town's name on that badge on your 26 Tudor? 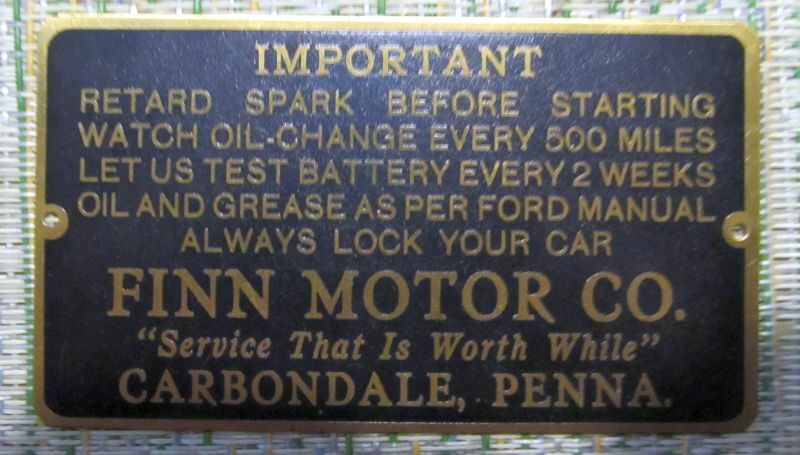 Here's the plaque on my car. Gunning is just north of Canberra. The dealership is still around. I posted a photo of my car at the dealership late last year. It is Beatrice, Nebraska about 30 miles south of Lincoln. 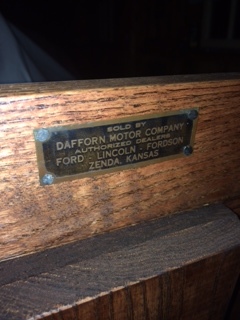 One of mine - I usually only buy New England ones, but this was so unusual (and it was from Kansas, which went perfectly with my '25 Shaw Conversion Tractor). 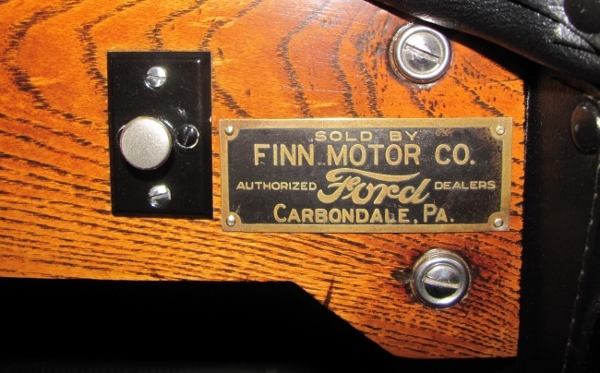 If anyone has a duplicate of the "Finn Motor Company" one they'd be willing to part with, please PM me. 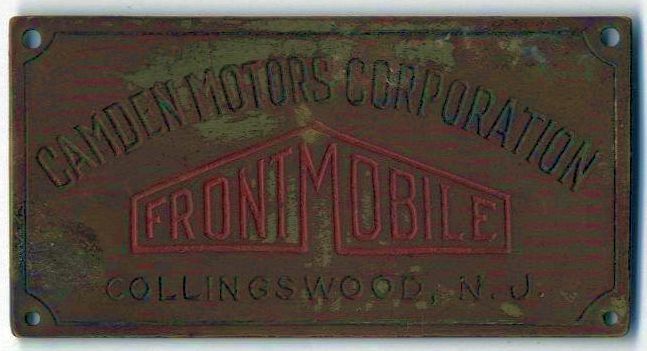 I'm currently working on a Model T/International Harvester conversion that came out of that area of PA and would love to find one of the Finn dealership plaques for it. 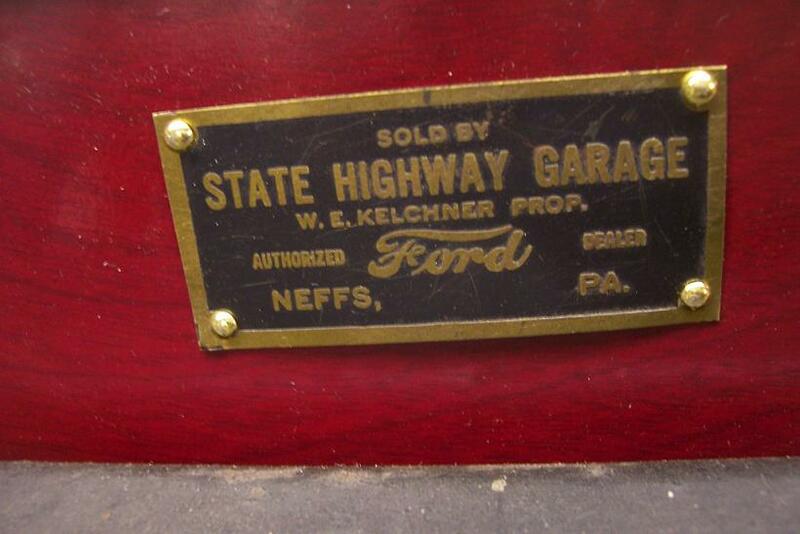 Would love an "Auto Sales Co, Whitehall Wisconsin" if anyone comes across one. 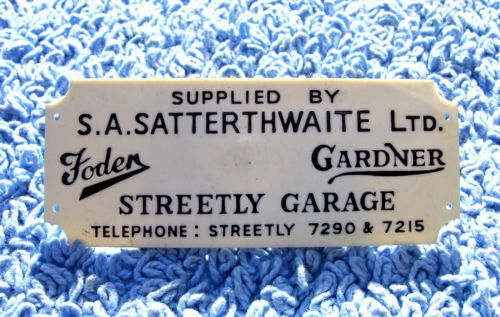 That was my grandpa's shop! 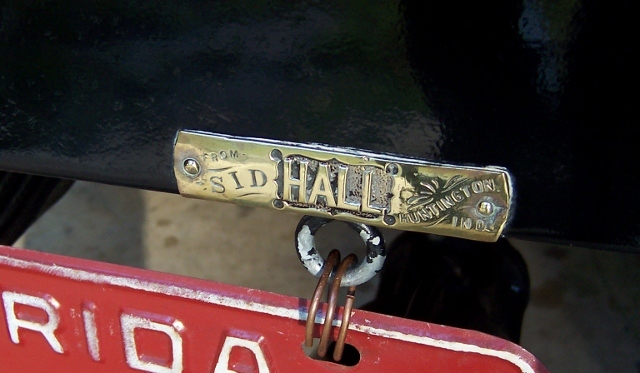 I don't know who makes the body and patent tags that the vendor's sell. Maybe they are all made overseas. 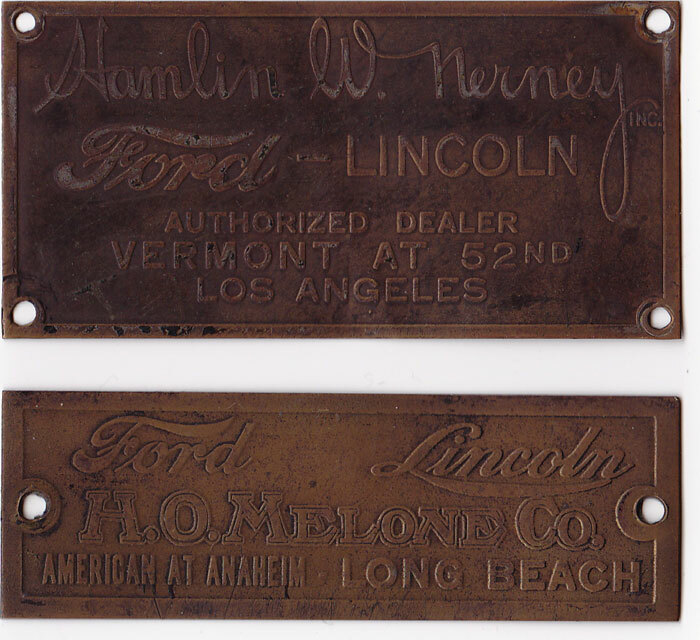 There used to be a guy in the New England states that silk screened new replacement VIN tags for 50's and 60's vehicles including Fords. He'd even stamp them with your VIN number. 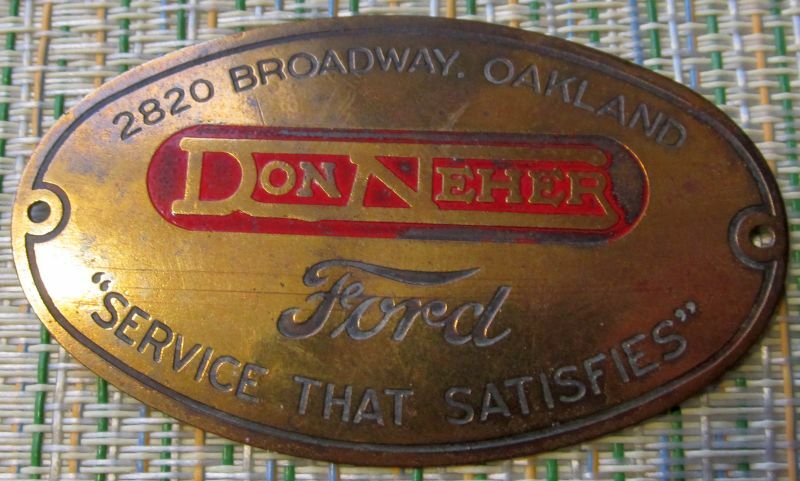 I don't know if he's still alive or in business, but it would be neat if you could order a custom dealer tag. 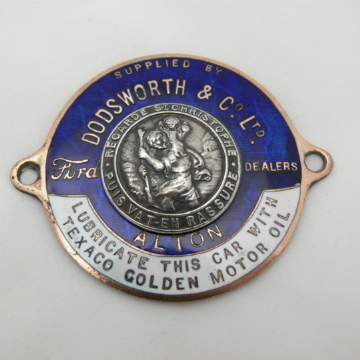 Are any dealer dash plaques currently available or new ones reproduced? 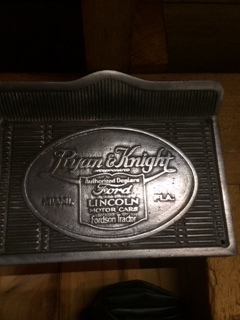 What do these plaques typically sell for ? 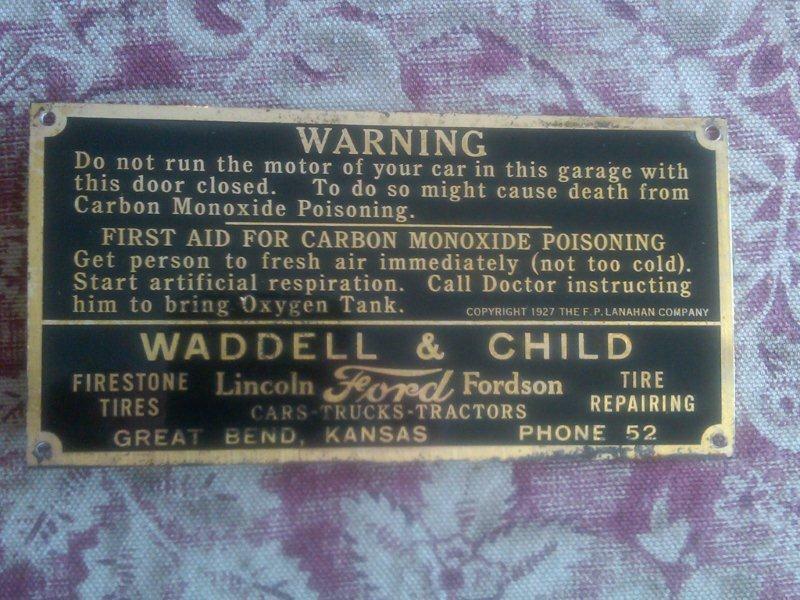 Not a dealer ID plate, but apparently supplied by Mobil Oil Co., as it refers to the use of their products. 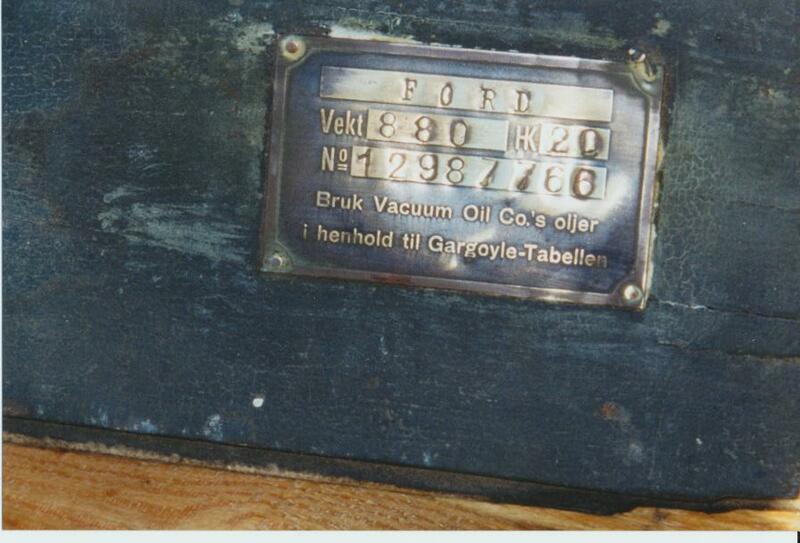 Shows "VIN" number, weight and engine horsepower. 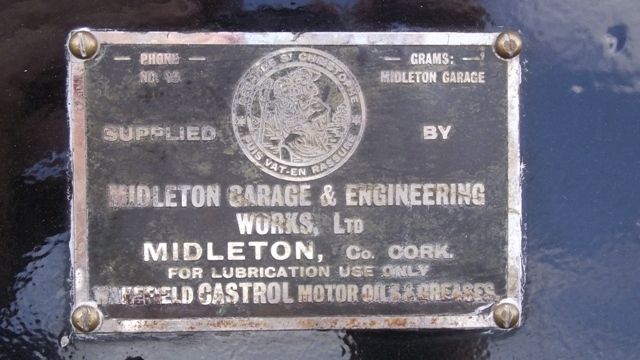 Plate attached to floor boards near choke/mixture rod. Alan, These are all the plaques you and other people have posted from the last two times I ran this thread. Thanks for sharing yours with us. What might I expect to pay for one of these ? 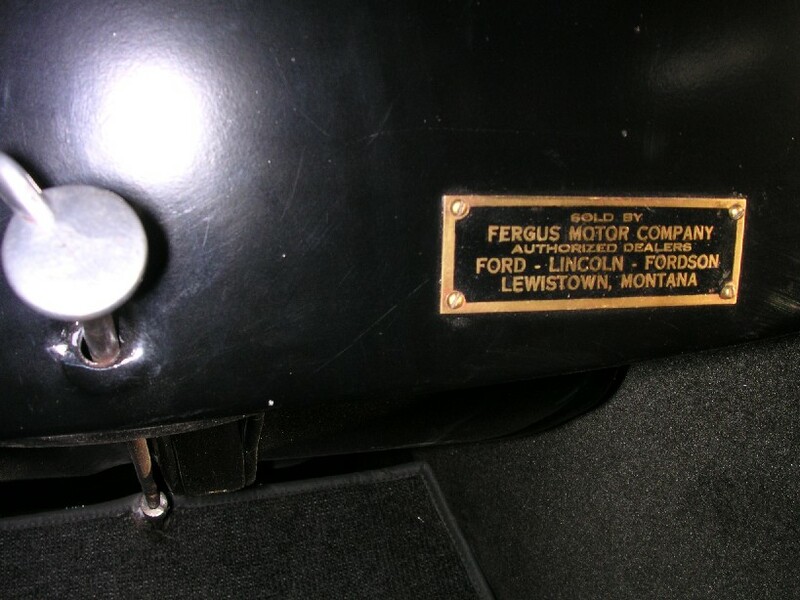 I have located one from the dealership in my town but have no clue what to offer. Brent, There isn't a catalog price for these. If it was one from my local area and in nice shape I would have no heartburn paying as much as 50 or 60 dollars for it to mount on my T's dash. Bill, it would be nice if someone would reproduce these. 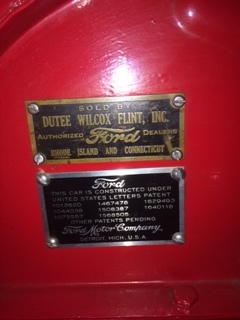 Does anyone know who makes the ford I.D. plates the dealers sell? Also, Jay, I haven't contacted him about the possibility of reproducing some dealer dash tags, and I'll imagine that it would be cost prohibitive to have dealer tags custom made for every individual dealer, but if enough members could agree to one particular tag where he could make them up in quantities of 100 or more, he just might do it. If anyone this side of China or Taiwan can do it, I'd bet on him. There isn't a catalog price for these. If it was one from my local area and in nice shape I would have no heartburn paying as much as 50 or 60 dollars for it to mount on my T's dash. Good intel. I was only looking for a general idea. Thanks. Probably easier to make a water decal than a plate. Looks like some of these were decals anyways. 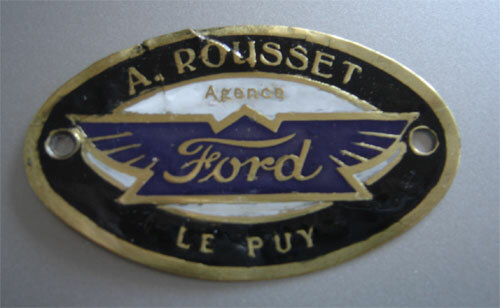 I might go for a decal since it can easily be removed, but a repro plate doesn't do much for me. 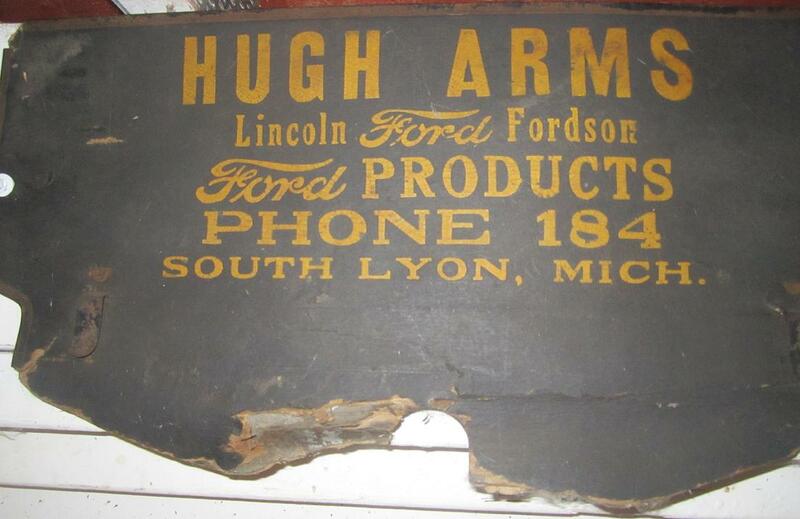 I'd love to have a plate from the Ford dealer of that period that was in my hometown and would pay dearly for one in good shape. 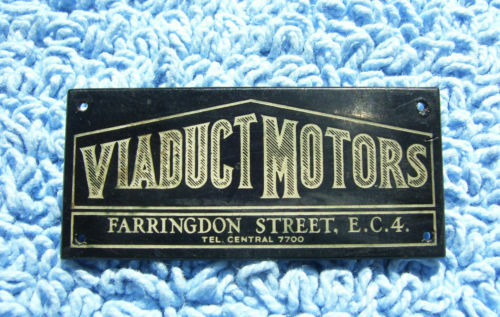 Problem is, the town probably consisted of no more than 200 people at the time and I'm not sure that the dealer ever invested the money necessary to buy and provide the plates and I'm probably one of only two or three T owners in the area who would buy one. Jay, if you contact Mr. Backeast, will you report your findings on this thread? 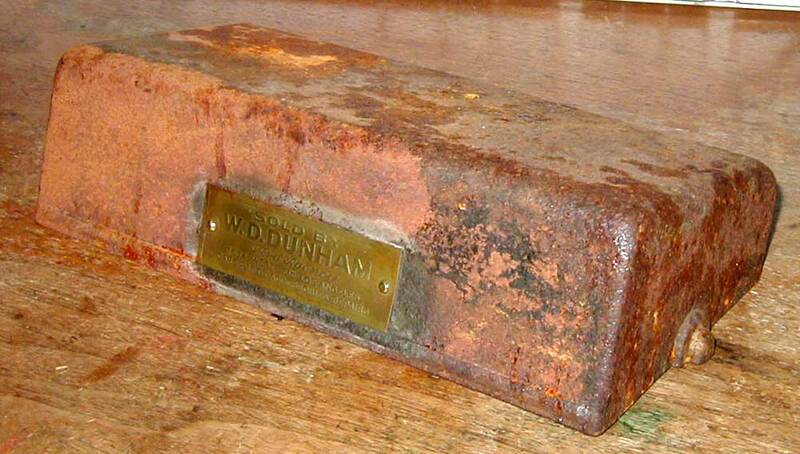 My brother pulled this from a body he found in a creek bed years ago. He would only let go of it if I got serious about T ownership. Davenport is the Lincoln County seat, next county west of Spokane. About 30 miles from me. 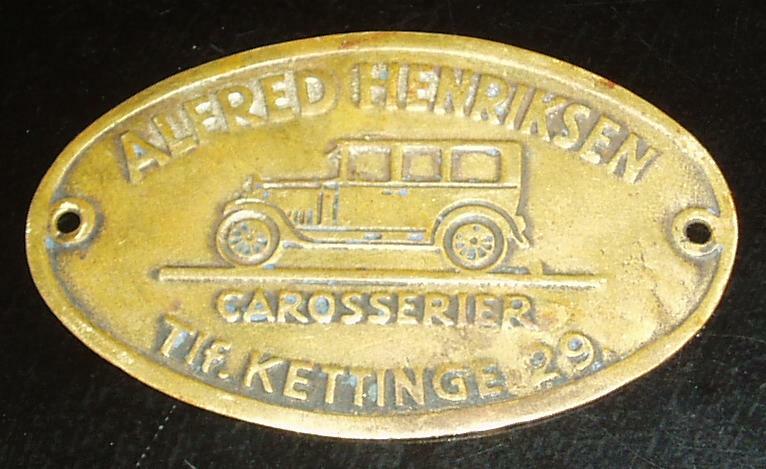 We made a trade last week for the tag and a C-cab. 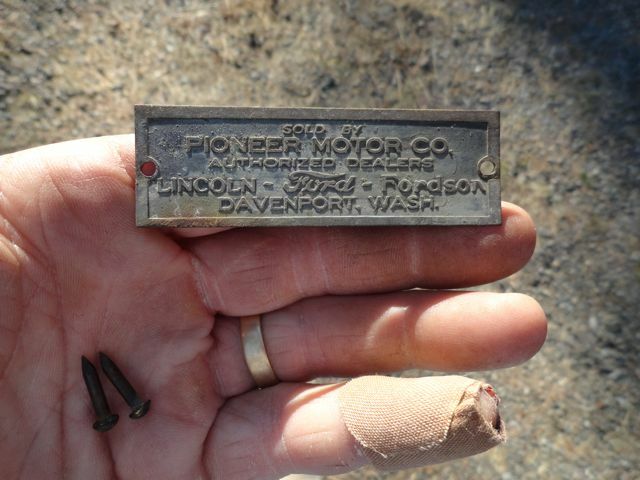 BTW - those are the original "pins" the tag was held to the dash with. Here is a new one for you Jay. 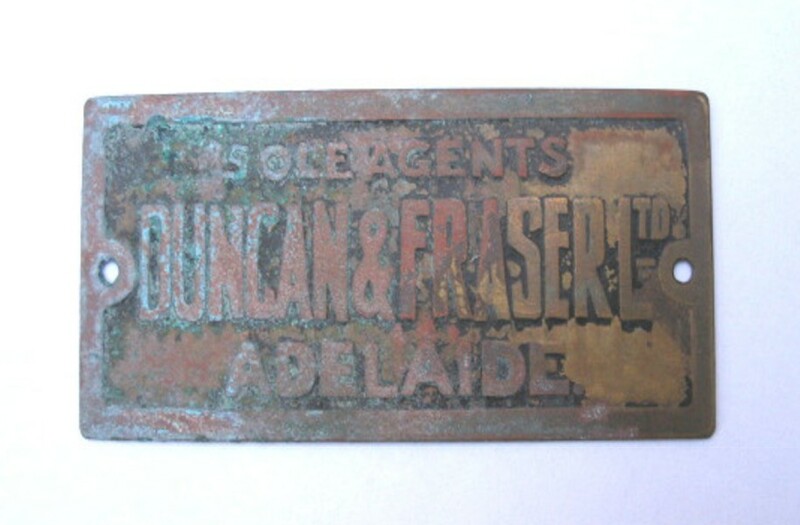 Mounted on the dash of a T Touring body from Melbourne, Victoria, Australia. Here is a new one for you Jay. 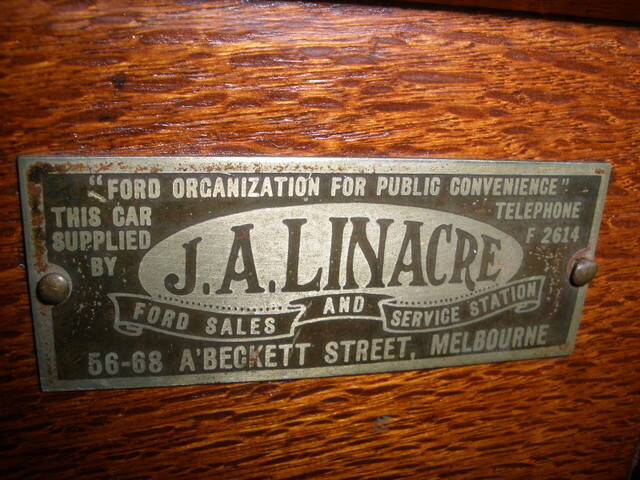 Mounted on the dash of a 1923 T Touring body from Melbourne, Victoria, Australia. 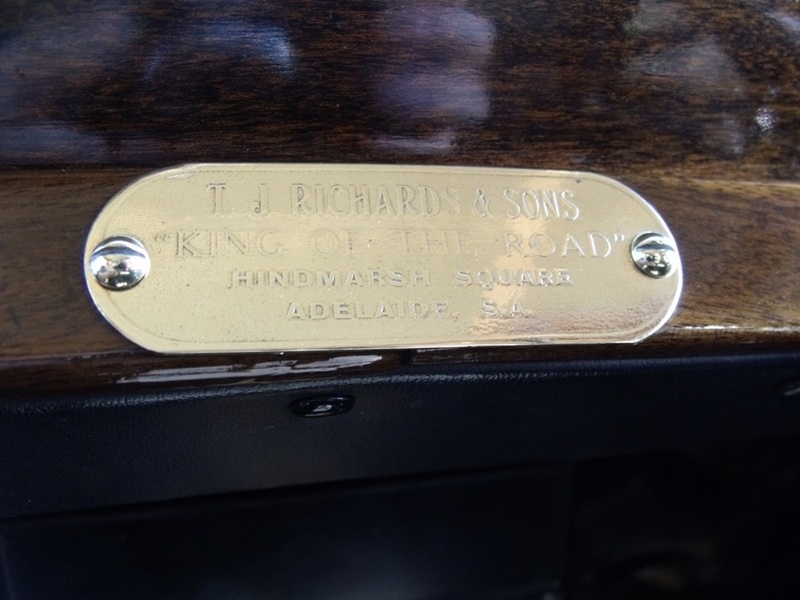 The lid I was told was for a 1916 car and so I passed it on to a pal who had a 1916 touring and was very happy to have this one. 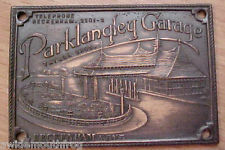 A building still stands at this address that looks old enough to have sold Model Ts. Cool Guys! Thanks for your additions! HAPPY NEW YEARS!